EXCLUSIVELY AT NEIMAN MARCUS Queen duvet cover combines truffle and teal woven medallion brocade with chenille accents, velvet and silk textures, artisan embroidery, and hand-sewn couture details. 90" x 95" Made in the USA of viscose, polyester, rayon, cotton, and silk. Jupiter duvet cover. Polyester/rayon front; polyester back. Tri-color twisted cord finish. Hidden zipper closure. 92" x 96". Dry clean. Made in the USA of imported materials. 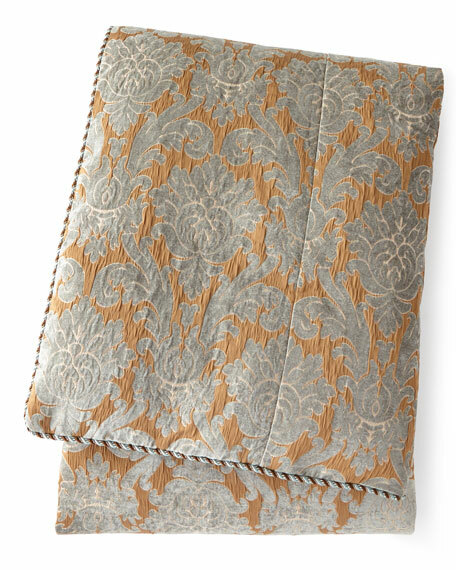 EXCLUSIVELY AT NEIMAN MARCUS Chenille damask duvet cover with twisted cording. Polyester/viscose front; polyester back. Zipper closure. 96" x 92". EXCLUSIVELY AT NEIMAN MARCUS Chenille damask duvet cover with twisted cording. Polyester/viscose front; polyester back. Zipper closure. 96" x 92". Dry clean. Made in the USA of imported materials. European-woven damask in navy and taupe with golden highlights. Tri-color twisted cord trim. 92" x 96". Dry clean. Made in the USA of imported polyester.